"Anime--Any Way You Want It!" is how Pioneer primed its' new VHS series of Anime. With the choice of either Subtitled VHS or Dubbed VHS, Anime fans without Laserdisc players could enjoy the growing library of Pioneer titles. First to be released were the first 7 episodes of Tenchi-Muyo! : Ryo-Ohki and the first three volumes of Moldiver. The Tenchi fandom exploded and gave Pioneer enough customers to finish releasing the last 3 episodes of Moldiver on both VHS and Laserdisc. Pioneer Anime was here to stay. KISHIN CORPS is a series set during the time of World War II, but the story doesn't focus around Hitler, it focuses around a special squadron of giant robot soldiers called 'Kishin.' The Kishin Corps stop the Nazi's from creating their own 'Kishin' with the help of an Alien race (yes, Aliens). With mood-setting symphonic music, an enthralling plot, and characters you sympathize with, this is definitely one of Pioneer's most under-watched series they have ever released. Most people will just hear the overall plot and skip right over it, but this is defiantly one to pick-up even if you hate war movies. The Green Legend Ran compilation was delayed until January 1995. 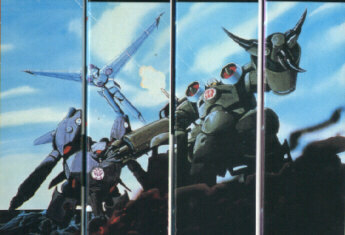 All three Laserdisc volumes were released in a boxed set. A 140 minute un-cut one volume Dubbed VHS compilation of GL for $39.95 (no extras) and an un-cut 3 volume Subbed VHS boxed set were also released simultaneously with the Laserdisc set and contained a T-Shirt, a 20 page booklet, and three sets of postcards. March 28, 1995 saw the release of the second Tenchi special, Tenchi-Muyo! : Ryo-Ohki Mihoshi Special. A 45 minute special told from Mihoshi's point of view with the Tenchi characters put into her story, which delves into what created her luck, and introduces Kiyone and The Magical Girl Pretty Sammy into the Tenchiverse. March 28, 1995 also saw the release of Pioneer's fifth series, ARMITAGE III, on both Laserdisc and VHS subbed and dubbed. Armitage III (The Third) is Pioneer's first 'more mature' release (on Pioneer's current rating scale it is for viewers "16 UP"). Unlike Kishin Corps, with this series, it was decided that the 4 episode OVA series was to be released on a bi-monthly basis on 4 separate VHS and Laserdisc.